« Possibilities Delayed or Lost? Beneath it all, was a Minnesota Iron Ranger steeped in the DFL Party’s desperate rush, during the 1950s and early 1960s, to establish itself as the People’s Party, filling in the void left by the Farmer Labor Party that had held sway in Minnesota for most of the Great Depression. Lord saw himself as a fighter-both literally and figuratively-for the ordinary man both in his role as Minnesota’s Attorney General and as a judge. Personal friends with both Hubert Humphrey and Eugene McCarthy, two United States Senators from the DFL who found themselves on opposite ends of the Vietnam War, Lord tried to bridge the philosophical gap between his mentors through mutual friendship, hoping upon hope to propel HHH into the presidency. He failed in bringing McCarthy back into the fold and, in the process, failed at electing Humphrey to the presidency. Admittedly, the sections of the book detailing Lord’s ties to politics are fascinating. But it’s Walburn’s depiction of Lord’s work on the Dalkon Shield cases that is the focus of her dissection of what made the man tick. A confession here. Perhaps I’m a bit too close to the subject matter. Not because I share Lord’s vocation, but because of my own background. I was a law clerk at the Robins, Kaplan, and Ciresi Law Firm when Judge Donald Alsop forced another Twin Cities law firm, after discovering improprieties, to disgorge over 400 Dalkon Shield products liability cases. I was working at the Robins firm when the boxes arrived a week before I left to begin my summer study for the Minnesota Bar Exam. Later, after I’d passed the bar, I represented two Duluth women who’d been injured by the Dalkon Shield in front of of Judge Alsop. Both cases settled but there’s no question that Judge Lord’s exposure of AH Robins’ malfeasance in manufacturing and promoting a device that devastated women’s health contributed to cases being resolved short of trial. 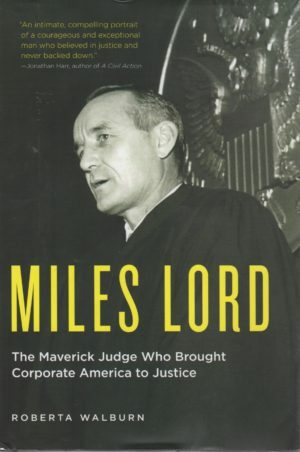 I found the author’s careful dissection of Judge Lord’s pugilistic background, juxtaposed upon the tense, ugly world of corporate litigation, to be a fascinating read. Mind you, there’s much that Miles Lord did in both the Reserve and Dalkon cases that caught the attention of the 8th Circuit Court of Appeals and got him in trouble with the appellate court. But, true to his Iron Range nature, reprimands and reversals did not change the judge’s belief that he was not just a referee between unequal litigants. In Miles Lord’s eyes, his role-as described in loving detail by his former law clerk- was to ensure everyone got a fair shake, damn the personal consequences. While that’s an admirable goal for a jurist, it’s one only those appointed to their jobs for life likely are able to fulfill with such unfettered bravery. All in all, one of the best Minnesota biographies I’ve ever read.